From game 2 of today's double-header. Josh bare-hand's a grounder. 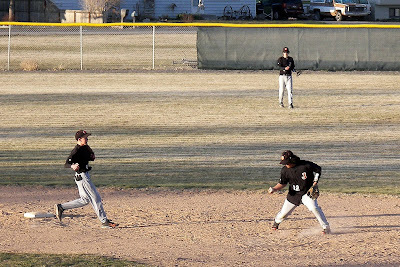 Yes, he made the throw for the out at first. and just as much kudos to the quick acting cameraman. I love Josh's concentration in this photo. In real time he seemed very nonchalant about this play. Frozen in this picture, however, you can see precisely how he looked the ball into his hand. He is playing with great confidence right now.